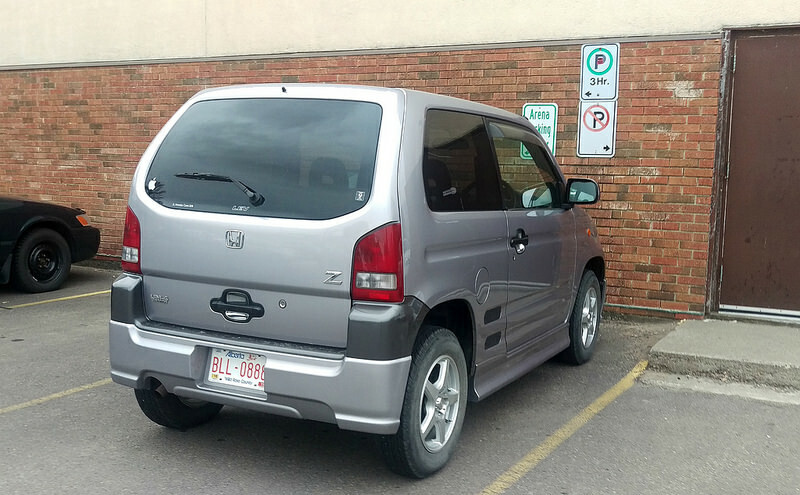 Curbside Classic: 2000 Honda Z UM-4 — Umm … What Is This? When I first spotted the rear view of this Honda Z UM-4 I thought it was some sort of electric vehicle I had not yet heard of. As I got closer the Honda H came into view. I had not heard of a recent Honda EV like this. The Z and UM-4 badging added to the mystery. Closer still I noticed it had a turbo call out badge so, it is definitely not an electric. After snapping a few photos I headed home for a little research and discovered this was a late entrant to the nostalgia wave that swept over Japan in the late 1980s and into the 1990s. 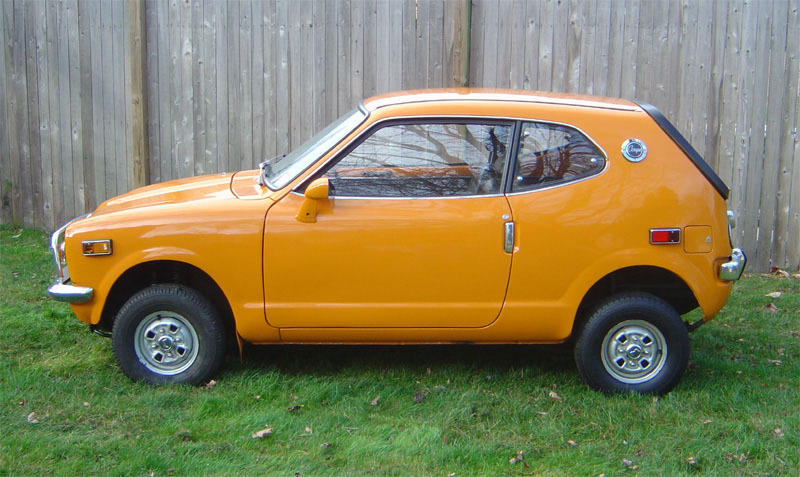 The Honda Z (Z600) of 1970 to 1974 is allegedly the car that inspired our example today. I suppose I can see it as both vaguely resemble a high top athletic shoe, but it is perhaps more of a visual reach than say an air cooled classic Volkswagen Type 1 to New Beetle. Both generations of Zs are supposed to be a sporty coupe based on a more humble sedan. In the older Z’s case it was based off the N360/N600. Engine displacement was modest at either 354 or 598 cubic centimeters depending on the model and market. The Z was quite advanced for its day with some variants offering red lines of 9,000rpms and surprisingly sprite (compared to its peers) performance. The new era Z continues on the tradition of borrowing from a more modest donor as it is loosely based off the Honda Life. The third generation Honda Life sports a 658cc three cylinder engine with either front or four wheel drive. 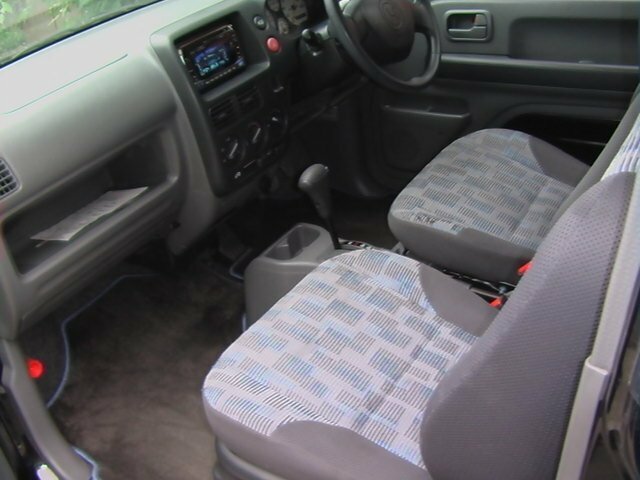 Buyers had the choice of a five speed manual or three speed automatic gearbox. This engine, which was shared with the Z, developed 52hp @ 7,000rpm and 45lb-ft @ 4,000rpm in base form. Starting in the year 2000 one could get their Life with a turbocharger and intercooler. The turbo model boosted power to 64hp @ 6,000rpm and 69lb-ft @ 3,700rpm. 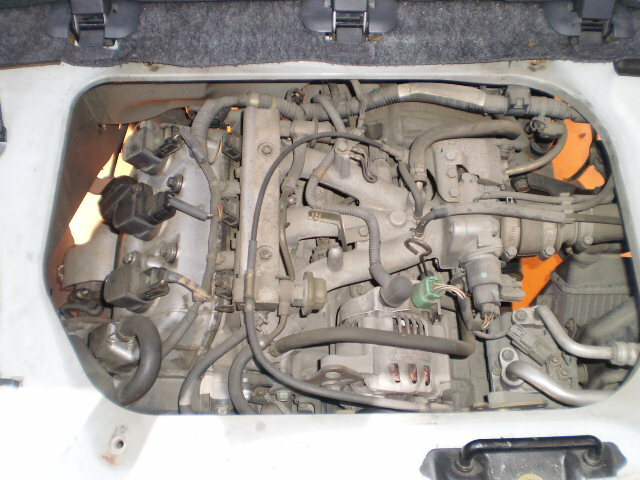 The turbo car was bizarrely dubbed the Honda Life Dunk. The Z UM-4 like our example today could also be optionally equipped with this engine. The Z has a surprise which these internet sourced images illustrate. Virtually opening the “hood” on the Z reveals what at first glance looks like a plastic engine cover but is actually a modestly sized storage container. The Z is a more radical than a mere re-style as it ditches the Life’s front engine placement for a mid engine design. The Z was only offered with four wheel drive and a four speed automatic transmission. The UM-4 name stood for Underfloor Midship 4WD which gave the Z a 50/50 weight distribution. Mid engined, four wheel drive and turbocharging put the Z UM-4 in some very exotic company specification wise. My shots of the interior did not work out so we’ll have to make due with this internet sourced image. There is seating for four with the rear passenger seat sitting on top of the engine. Routine maintenance is done via an access panel under the seat. With the body colored bumpers that came standard with the UM-4 model we know that this is at least a 2000 model and thanks to Canada’s rolling fifteen year exception we can narrow it down to no newer than 2000. So a 2000 Honda Z UM-4 is what I believe it is. For reference the Z is 133″ long which is roughly 10″ longer than a Scion iQ. 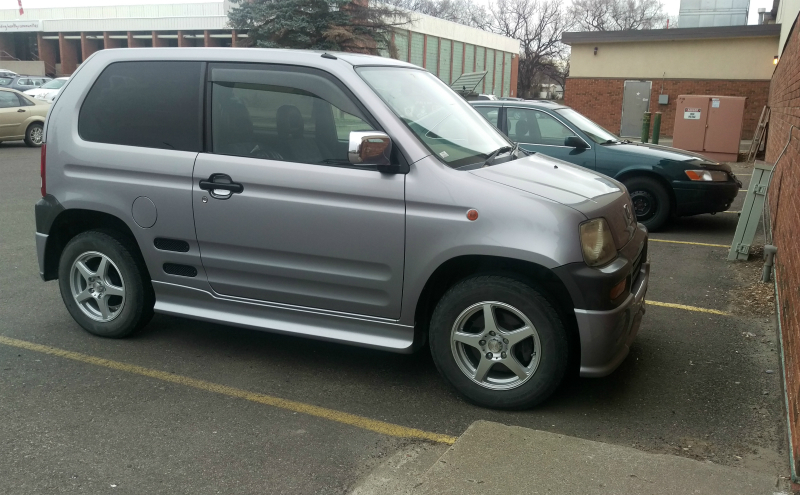 While I am still not sure exactly what the Z UM-4 is, some sources call it a Kei class SUV while others call it a sporty variant on the Life, I am glad someone took the time to import it to Canada. It is not everyone day you learn about a vehicle that is totally new to you. I’m quite used to weird Japanese cars our roads are littered with them including these, they arrive by the ship full and the car dealers foist them off either by direct sales or public auction, and I get stuck behind them on the highway in a truck, I’m sure these kei cars are not meant to leave the suburban streets but they do. So Honda built a mid-engine four door hatchback? Wow. I can remember the original Z – were they all that colour? From the side it looks kind of like a Scimitar that shrank in the wash. Can’t really see any resemblance to the new one. Looks vaguely like a corrugated Fiat Panda though. I’ve seen Honda publicity pics of original Zs in bright blue, red and lime green as well as the orange. They were fairly common cars in Australia. As well as what nlpnt mentions, there was also white and a sort of metallic khaki. Orange was by far the commonest though. Very nice article. Here in Japan, these were all kei class cars with the 660 engine and kei class dimensions. They were popular in Northern Japan which gets quite a bit of snow. Other manufacturers also built kei class small SUVs, Suzuki and Mitsubishi’s being I believe, the most popular. Kei class minicars, as I think most folks know, are much less expensive to register and insure. They are registered at local city halls instead of regional land transportation offices, have much lower “shaken” or Japanese Compulsory Insurance inspection fees, and lower annual weight taxes. One other benefit is that they do not require a police issued parking certificate (in Japan’s larger cities you have to show proof of a parking spot) to register the vehicle. Question for you: Are sha-ken fees or insurance costs also still lower for 5-/7-number cars than for large (3-number) cars? I’m assuming there are still some cost advantages to saying out of the latter class even if the vehicle isn’t a kei. My experience has been that Shaken costs are pretty much the same for anything above the kei class – above 660 cc. I don’t think there is any cost difference between under 2.0L engine class (5/7 number plate) and those above 2.0L (3 number). There is a difference in road and weight tax – the smaller/lighter vehicles pay less. My vehicles are registered with the US military and we pay about one-third in road tax what the average Japanese pays – under 2.0L is 7500 yen per year and over 2.0L 19,000 yen. So yes, operating costs for a under 2.0L car are less than one with a larger engine. Wow, the jump is more than it was in the ’80s. I thought for a while the progression in road tax above 2 liters was more gradual (if still a lot). 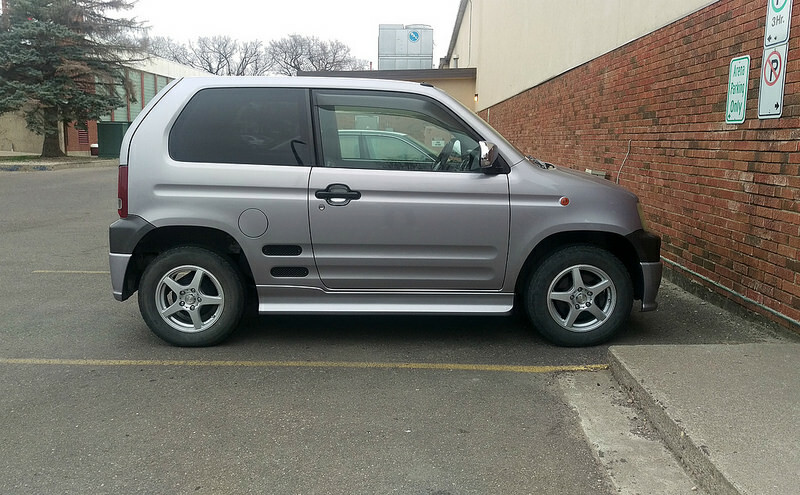 No wonder so many people are buying kei cars now. I remember the original Z600 available in either the orange shown or yellow. During my Erie days, a good friend (and short term employer) had one of the yellow ones, and I used it quite often. Including rallying it on occasion and even did one D-sedan autocross with it. At which point he dumped the car for a Sebring-Vanguard CitiCar. Which I also drive quite often, thus giving me a great deal of electric car experience back in the days when nobody had it. I’d love to own one of each today, although the Honda goes for some fairly serious money which CitiCars can be bought quite cheaply – assuming you can find a survivor. Trust CC to find the truly intriguing car we never thought we’d need. A 4×4, mid engined Kei class SUV? It looks a bit like this truncated mini van I spotted some years ago. That Panda Defender looks waaay better. 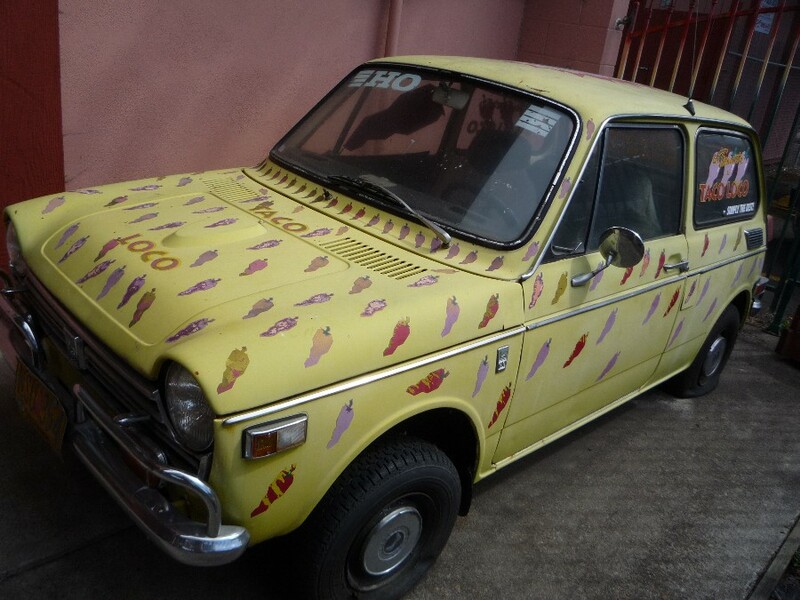 The Honda is stilll beyond cool though, if only because of its sheer weirdness. I have such a soft spot for the Panda 4×4. My first car was that generation Panda, albeit a lesser FWD CL 1000 and I loved it to bits. 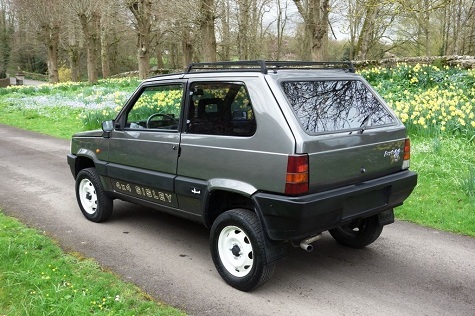 There’s definitely a well restored Panda 4×4 in my fantasy garage, ideally a posh Sisely like in your pic. This looks (admittedly quite vaguely) like a shrunken 90s Mazda MPV. Or maybe, not so much shrunken as crushed into a smaller package? I drove an N600, which this Z more closely resembles, in the early-mid 70s. 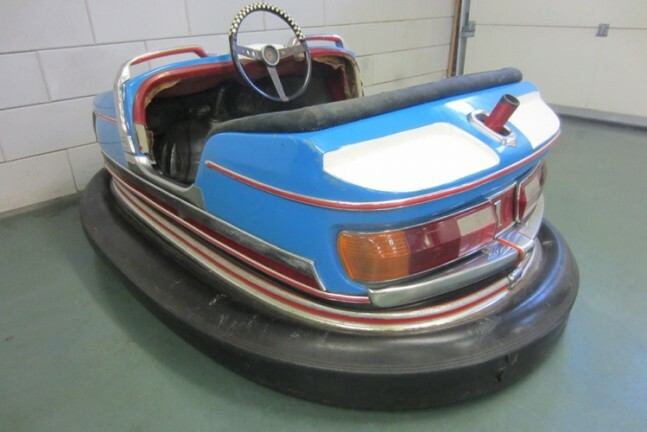 They are sort of fun….for a while, but nowadays they would be a nightmare if driven on anything but city streets. EVERYTHING is so much bigger than they are….except iqs. BTW, have seen Z600s in red, yellow, orange, blue, and green, but orange and yellow were most popular. That’s the one. Mazda MPV and a hot tumble dryer! Wow. Never seen one before. Maybe they should have used a rubber ring around the rear window if retro was the aim. I recommend a rubber ring around the whole car. I am so envious of you Canadians – you get all the cool stuff. As a Hondaphile, this excites me. Such an odd combination of attributes. If anyone else has occupied this niche (to the extent that this even qualifies as a niche ) I cannot think of it. Great find. Never knew about this. VW gave serious consideration to the same under-seat configuration for what became the Golf. Porsche built the prototype EA 266. Very space efficient, but getting to the engine is a bit of a pain. Cool. A 411 nose with a Civic greenhouse. The turbo version 4wd would be a riot for zipping around town, and still have plenty of power for the occasional short freeway trip. Don’t think I could put up with being right hand drive, though a camera mounted to the left mirror would probably be a big help. Great find, cool little car. ??!! 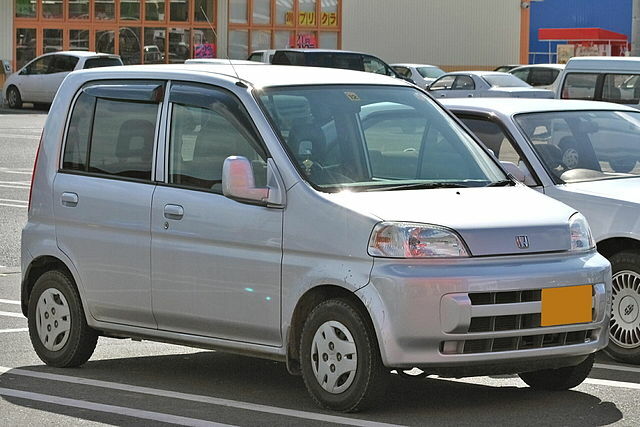 The UM-4 is completely new to me – and to think I’ve read about all Honda models, including the JDM ones we don’t get in the U.S. Honda sure made some quirky cars back in the day. 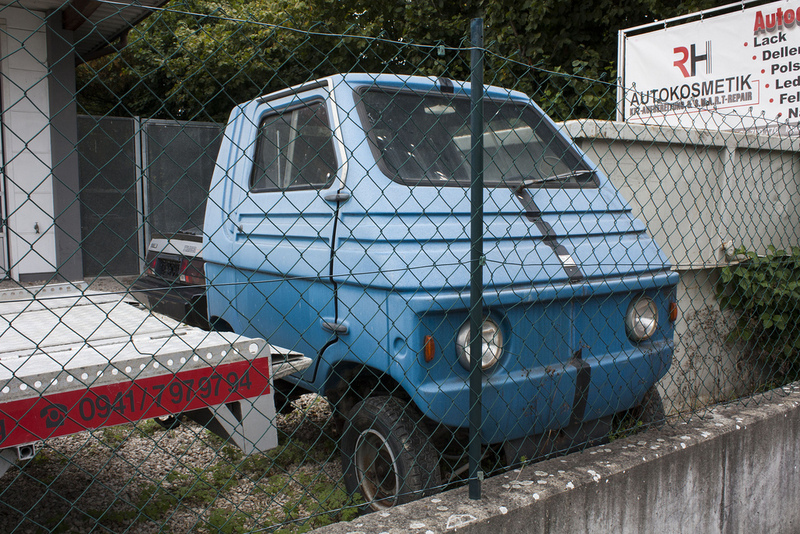 The UM-4 resembles a shrunken first generation Fiat Panda. Ummm indeed. What an odd little car, but neat find. Honda Life Dunk belongs in the Hall of Fame of odd car model names.